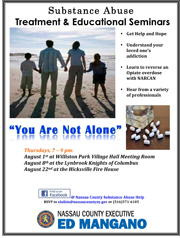 Nassau County Legislator Rose Marie Walker and County Executive Mangano announced that a substance abuse communityforumcalled “You’re Not Alone” will be held in Hicksville on August 22nd for all residents to attend. The Forum will include a panel ofexperts in the fields of substance abuse treatment, recovery, criminal justice and law enforcement to answer questions about what todo and how to deal with your troubled loved one – no matter what age – who may be struggling with substance abuse. 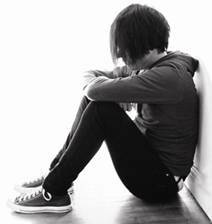 “Drug abuse can strike any family. This community meeting will offer assistance to residents who may have a loved one who struggles with prescription or other drug abuse,” said Legislator Walker. The forum will include an informal group discussion with the experts, including some one-on-one time to chat and ask private questions. The panel will also include an addict in recovery, as well as the parent of someone in recovery, to offer their perspectives. The event is being hosted by the Nassau County Prescription Drug Misuse and Abuse Prevention Task Force, which was created by County Executive Mangano after the fatal Medford Pharmacy robbery in 2010, and is in conjunction with the County’s Departments of Mental Health & Chemical Dependency and the Nassau County Police Department. The Q&A discussion will be followed by a hands-on demonstration on administering Narcan or Naloxone, which can reverse the fatal effects of a Heroin or Prescription painkiller overdose. No medical training is needed. Free kits will be given out to those over the age of 18. For more information, or to register for this forum, call Community Affairs at (516) 573-7360 or email Elaikin@nassaucountyny.gov.